Gold Plated Phono RCA Chassis Sockets - Quality Panel Mount Audio Connectors Gold Plated RCA Phono Chassis Mount Socket with solder bucket. 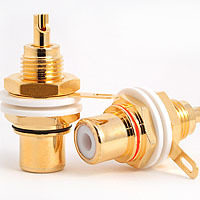 Professional grade female panel connector with Teflon insulator and supplied with isolation washers. item code: PHOSOC01. Silver Plated Phono Sockets - Panel Mount RCA Chassis Connectors Professional grade silver plated RCA panel connector. This well finished phono chassis mount socket has internal Teflon isolation plus washers for mounting onto metal wall plates. Solder type connection. Item code: PHOSOC02. 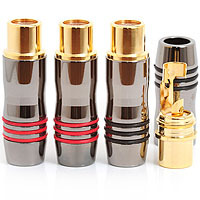 RCA Female In Line Connectors - Gold Plated Phono Extension Sockets High quality in line phono socket for audio cables up to 6.3mm diameter. 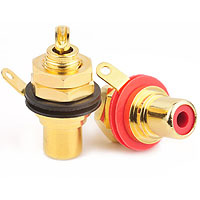 These stylish gold plated RCA extension connectors have polished nickel handles with red and black colour bands. 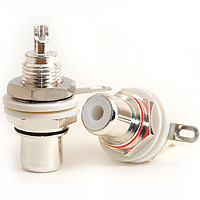 We also supply matching phono plugs. Item code: PHOEXT01.